USB-C is fast becoming the standard connectivity interface of choice in latest Android smartphones as well as the latest iPhones, Macbooks and devices such as Nintendo Switch and smart TVs. The best feature of USB-C is that it allows everything from data transfer to charging (with USB-C Power Delivery or USB-C PD) from a single common port. Even though the USB-C devices can be charged from the old USB wall chargers and powerbanks using USB to USB-C adapter cables, it is highly recommended to charge the new USB-C devices from only the USB-C PD wall chargers that can deliver the maximum supported charging current/voltage for the USB-C devices. High-output USB-C PD wall chargers and powerbanks will charge USB-C devices much faster as they can deliver much higher charging voltages and currents with charging power reaching up to 30 watt, 45 watt or even 60 watts. Latest USB-C smartphones support maximum charging power of 15-18 watt (Samsung Galaxy S9, S8 and Apple iPhone Xs, X, 8, 8 Plus). USB-C PD laptops such as new Macbook Pros and Macbook Airs support way higher maximum charging power of 30+ watt and all the way up to 60 watts. Here is our selection of best USB-C PD wall chargers for smartphones and laptops, selected on the basis of build quality, supported maximum current, features, and price. Two ports let you charge two devices simultaneously – you can charge both your powerbank and phone at once. The 18-watt USB C (with USB PD) port delivers fastest charging power for all smartphones. The USB PD port fast charges Apple iPhone X, iPhone 8, iPhone 8 Plus to 50% in 30 minutes. Very competitive price. Anker PowerPort PD2 costs less than Apple’s newly launched official 18-watt wall charger which comes with a single port only. Confusing naming scheme. 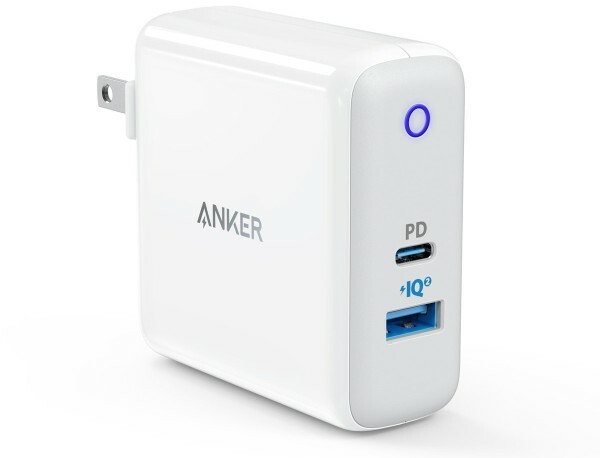 Anker’s 30 watt PowerPort PD2 (18+12 watt) and 49.5 watt Powerport II PD (30+19.5 watt) USB-C PD wall chargers have very similar names. 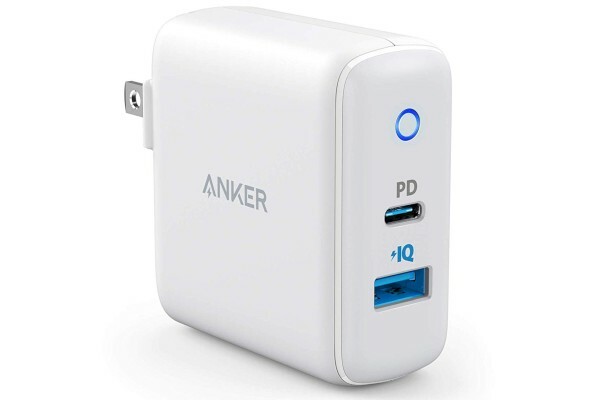 Anker PowerPort PD2 30-watt dual port wall charger is hands down the best pick for fast-charging (0 to 50% in 30 mins) the latest iPhones and the latest USB-C PD Android smartphones. Anker PowerPort PD2 comes with two ports – one 18-watt USB-C PD port for fast-charging the new iPhones and Android USB-C PD phones and one 12-watt USB port for simultaneously charging another device such as powerbank or another phone. PowerPort PD2 is a better choice than Apple’s newly launched single port 18-watt USB-C wall charger for fast charging new iPhones as the Anker PowerPort PD2 comes with two ports and also costs much less. Please note that besides charging smartphones if you also plan to frequently charge Macbooks, then you should select Powerport II PD 49.5 watt USB-C PD wall charger (described below) which has a 30-watt USB-C PD output port especially for charging Macbooks. Two ports! This lets you charge two devices at once – charge both your powerbank and phone at once. The 30-watt USB C (with USB PD) port delivers excellent charging power for both smartphones and laptops. The 19.5 watt USB PD port fast charges Apple iPhone X, iPhone 8, iPhone 8 Plus to 50% in 30 minutes. Very competitive price. This new Powerport II PD charger costs same as old single port Anker PD charger. Anker’s 30 watt PowerPort PD2 (18+12 watt) and 49.5 watt Powerport II PD (30+19.5 watt) USB-C PD wall chargers have very similar names. Released in March 2018, the new Anker PowerPort II 49.5-watt USB-C PD dual wall charger is our top pick among available USB-C wall chargers as it offers a highly capable 30-watt USB Power Delivery (USB PD) output port alongwith an additional 19.5 watt max output capable fast charging USB port. The USB-PD port will fast charge iPhone X, 8, 8+ (50% in 30 mins). It will also charge Nintendo Switch at its maximum possible 18-watt PD output. The Power Delivery (PD) port charges Macbooks at quite fast 30-watt charging output – same as Apple 29-watt Macbook charger. Apple’s latest iPhone X, iPhone 8, iPhone 8 Plus also now support fast charging over USB-C PD allowing you to fast charge your iPhones to to 50% in 30 minutes. This second port (regular USB) is Quickcharge 2.0 compatible and will fast charge all the latest Samsung smartphones such as S9, Note 9, S8, S8+, S7 etc. as well as other Android phones such as Google Pixel 2/Nexus 6P/5x/LG V30 at the fastest possible charging speed. The Anker PowerPort II PD 30 watt wall charger features folding pins and compact size that make it great for travel. 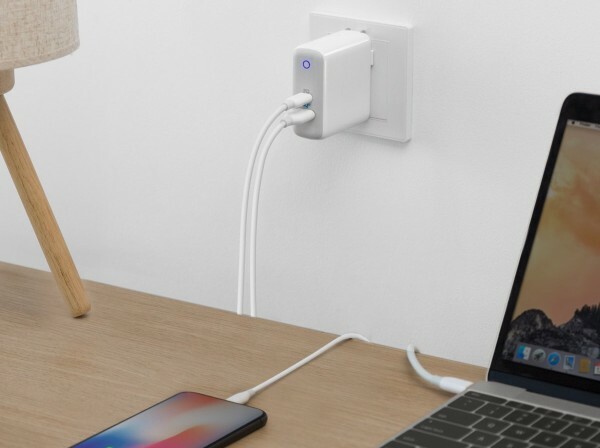 With the Anker PowerPort II USB-C PD charger , you have to now carry just one wall charger with you to charge two devices – including one USB PD device such as Macbook – at once. Fast charges Samsung S9, S8, S7 etc. Higher overall output would have been great. RAVPower 36-watt Dual Port USB Type C PD wall charger is our top pick among value for money USB-C PD wall chargers for smartphones. This wall charger comes with 2 charging ports, giving you the option to charge two phones or powerbanks at the same time from one wall socket. The USB C PD port can output up to 29 watts of charging power, making it perfect for fast-charging the latest iPhones (iPhone Xs, Xs Max, X, 8, 8+) and charging Macbooks. The second port can output 12-watt, making it well-suited for charging smartphones. All this is available in a quite compact 3 inch by 2 inch form factor which does not seem too bulky given the number of available ports. 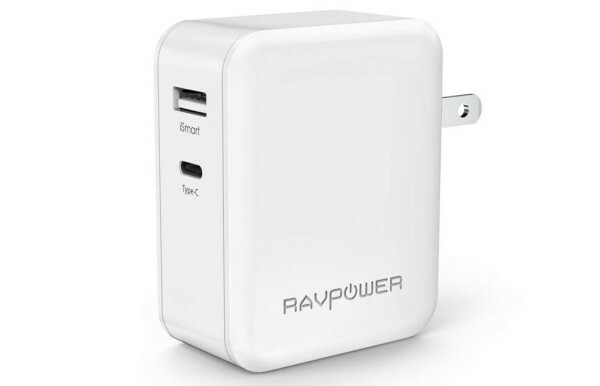 A 24-month warranty and an excellent price make the RAVPower 36-watt Dual Port USB Type C PD wall charger an excellent reasonably priced USB-C charger package for smartphones. 60 watt USB-C with USB Power Delivery output for charging Macbooks & laptops (Dell XPS 13, Yoga 370/900 910, Zenbook 3 etc.) at maximum charging speed. Fast charges Apple iPhone X, iPhone 8, and iPhone 8 Plus. Cable Matters 72W 4-Port USB-C Charger with USB Power Delivery 2.0 is our top overall pick among USB-C PD chargers for laptops (and other USB PD devices). This wall charger comes with a 60-watt dedicated USB-C port which supports USB PD 2.0. This allows you to charge Macbooks and a huge number of USB- compatible laptops at a very fast charging speed of 60 watt (60 watt is also the maximum charging speed of stock Macbook Pro 2017 charger). Cable Matters 72W 4-Port USB-C Charger will also charge other USB-PD devices such a ssmartphones and Nintendo Switch at their maximum supported charging current as well. The 3 regular fast charging USB ports allow you to charge more phones and deliver a combined output of 12 watt. This greatly increases the usability of the device and makes it possible to charge a laptop/Macbook, a powerbank and a phone simultaneously . The Cable Matters 72W 4-Port USB-C Charger is Thunderbolt 3.0 capable and can charge Macbooks laptops such as the 2016/2017 MacBook Pro, Dell XPS 13, Razer Blade Stealth etc. at a maximum charging power of 60 watt power. 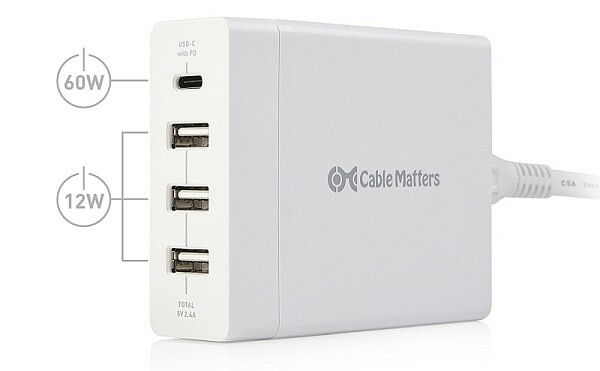 All Cable Matters 72W 4-Port USB-C Charger has a reasonably compact 3.6 inch x 2.4 inch x 1 inch form factor which is good given the number of ports on it. The Cable Matters 72W 4-Port USB-C Charger supports 110-240 volt & 50-60 Hz AC input, thus making it ideal for travel. To top it all, the price is extremely reasonable, thereby making it an extremely attractive package. For its 60 watt USB-C port, additional 3 USb ports, solid build, world wide AC input support and excellent price, Cable Matters 72W 4-Port USB-C Charger is our top overall pick as the best USB-C PD charger for laptops & smartphones. Just one port, another port (even a normal USB) would have been very handy. However, for charging only a phone or a laptop, this compact charger delivers unbeatable value and performance! iClever BoostCube 45W USB Type-C Charger is our top pick among value for money USB-C PD capable compact chargers for laptops as well as smartphones. 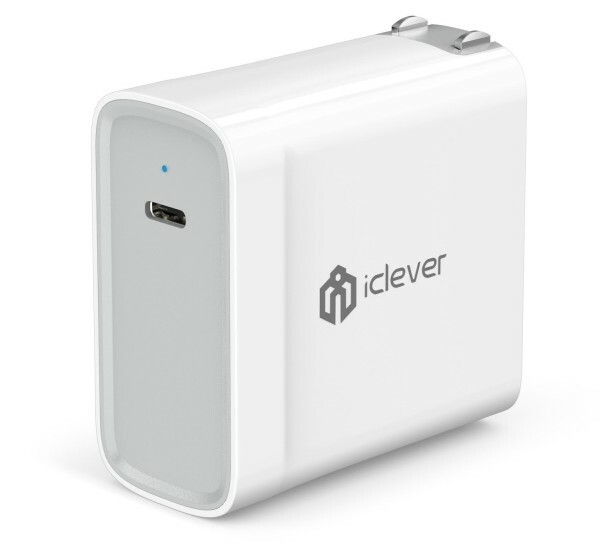 iClever BoostCube 45W USB Type-C Charger has one USB-C port capable of delivering a maximum of 45 watts of charging power. This is well suited for Macbook Air, Macbook Pros and many other USB-C supporting laptops such as Dell XPS 13, Lenovo Yoga 370/900 910, Zenbook 3etc. iClever BoostCube 45W USB Type-C Charger is a compact and light charger with a form factor of 2.4 inch x 2.4 inch x 1 inch and is well suited for travel thanks to its folding design. The excellent pricing as well an included USB-C cable is another reason why iClever BoostCube 45W USB Type-C Charger is our top pick. Another USB port would have made this charger incredibly better. However, give its light, compact, and folding design and good build quality with an incredible 45-watt charging prowess, iClever BoostCube 45W USB Type-C Charger is easily the best value for money USB-C PD charger in the market and our top compact USB-C PD wall charger pick.